The NASA/German Research Centre for Geosciences GRACE Follow-On spacecraft launches onboard a SpaceX Falcon 9 rocket, Tuesday, May 22, 2018, from Vandenberg Air Force Base in California. Credit: Bill Ingalls/NASA. NASA has two new eyes in the sky after SpaceX successfully deployed a pair of sensitive spacecrafts that can detect tiny changes in the Earth's gravitational field. Why it matters: Known as the GRACE-FO mission, for Gravity Recovery and Climate Experiment Follow-On, the satellites will provide scientists with crucial data for tracking climate change. 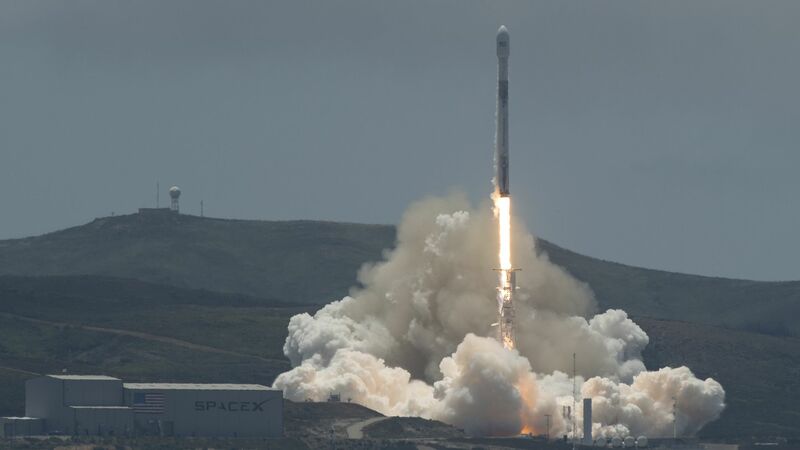 The details: The satellites, which were deployed atop a reused SpaceX Falcon 9 rocket that lifted off from Vandenberg Air Force Base in California at 3:47 p.m. ET., are capable of detecting changes in groundwater availability worldwide, giving early warning to security agencies about potential areas of political instability due to potential conflict over natural resources. The GRACE-FO mission, which is technically a joint mission between the U.S. and Germany, will also be used to answer critical questions about how quickly and extensively the planet's ice sheets are melting. The first GRACE mission helped scientists discover the quickening pace at which Greenland and parts of Antarctica are losing mass, which is raising sea levels worldwide. Be smart: According to NASA, the twin satellites will follow each other in orbit around the Earth, separated by about 137 miles (220 km.) As they do so, they will send microwave signals to each other. Areas of slightly stronger gravity (more mass) as well as slightly weaker gravity will change this distance slightly. By using these changes, they will enable scientists to map water resources, ice sheets, and potentially discover other applications as well. Go deeper: First map of global freshwater trends shows "human fingerprint."